(A) indicates the frontal method for firearm and captive bolt, (C) indicates the temporal method suitable for firearm only. The dots indicate the point of aim and the arrows indicates the direction of aim. A firearm should deliver at least the muzzle energy of a standard 0.22 magnum cartridge. 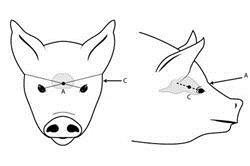 For older boars and sows, use a 0.30 calibre firearm. Most captive bolt pistols are suitable for small pigs; however, large pigs require the use of high-velocity captive bolt pistols. Animals should be bled out immediately after shooting with the captive bolt, while they are unconscious, to ensure death. A firearm should deliver at least the muzzle energy of a standard 0.22 long rifle cartridge and should be aimed in the frontal or temporal positions. Blunt trauma should only be used when there is no other recommended option available. Only use blunt trauma on newborn piglets that are less than 24 hours old. Immediately bleed out the piglet, while it is unconscious, to ensure death. Read about duty of care to animals.